Ear Candling is a simple and time proven therapy that can be very effective in removing troublesome and old blockage from the ear canal without the use of solutions and probes. This natural way has helped people to rediscover the value of ear candling to cleanse the ear canal and sinus passages. Ear Candling is a home remedy, dating back to the year 2500 B.C. Ancient cultures, including the Egyptians, made reference to its use. Even the findings of parchments scrolls in the Orient described the procedure for ear candling. 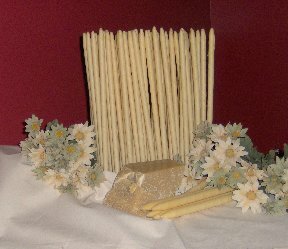 Bees wax was and still is a key element for making the ear candles. The principle cloth used by ancient Egyptians was linen made from flax which were the fibers’ of a blue flowered annual plant. Bee Natural Ear Candles uses muslin which is 100% unbleached cotton that has been the cloth choice for decades. Our candles are handmade from 100% pure beeswax. These fabricated candles range between 12 and 13 inches in length and are available in two widths, ½ inch and ¾ inch. Candles can be purchased in bulk or small quantities. Shipping and handling charges are not included in this price list. At this time no HST is charged on any orders. Method of payment accepted is Visa/MasterCard, cheque or cash. For a free quote or to place an order, please call 905-774-8065, fax 905-774-8793 or E-mail Me.